Two vases from Russia’s Imperial Factory of porcelain were recently found in Oklahoma and have been identified by the Hermitage Museum in St. Petersburg, Russia. The vases are valued at $1–1.5 million and will be put on sale on Apr. 17 at the Dallas Auction Gallery in Texas. 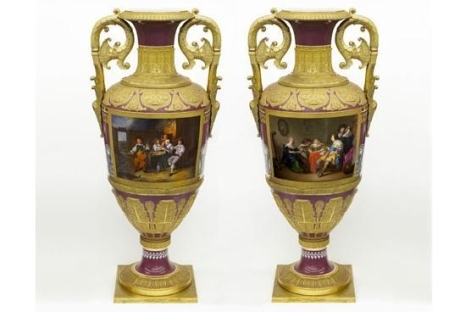 These monumental vases, 4.4-feet-tall and dating back to 1832, are surely among the most beautiful pieces of Russian porcelain presented on the market in recent years. The estimated worth is $ $1–1.5 million for each vase. Ekaterina Khmelnitskaya is the curator of the porcelain department at the Hermitage Museum of St. Petersburg and the expert charged with the authentication of these pieces. “The discovery of these vases is a real event. They mark the golden age of Russian porcelain production during the reign of Nicholas I, and the quality of their execution is exceptional,” says Khmelnitskaya. The vases were bought from a Munich gallery in the mid-1920s by Frank Buttram. At the time, Buttram was an oil magnate, philanthropist and art enthusiast from Oklahoma traveling through Europe. Probably, then, the vases are among the countless Imperial riches scattered by the Communists upon their arrival to power. After nearly a century in the family collection, the vases are finally to be presented to the public and will be put up for sale on Apr. 17 at the Dallas Auction Gallery. Buttram’s descendants have expressed the wish to see the vases return to their country of origin.